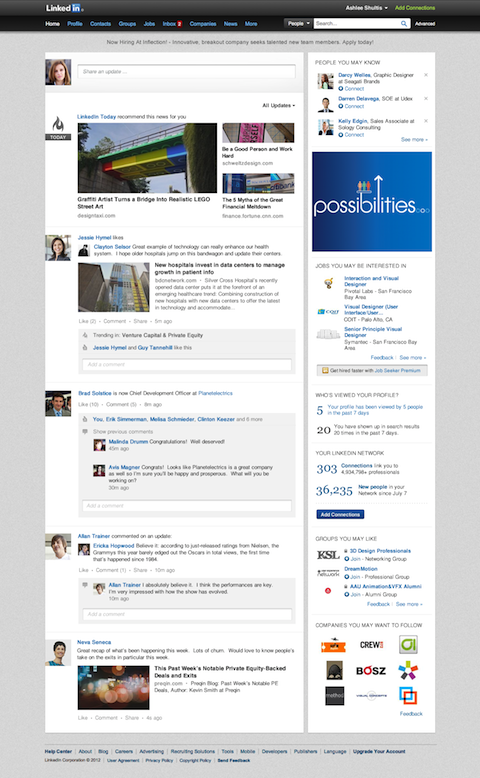 LinkedIn Today Gets New Social Features: Users can now add comments and “likes” to articles on LinkedIn Today. And the new “Trending in Your Network” tab filters all of the professional news articles on LinkedIn Today and gives you the most popular ones in your professional network. 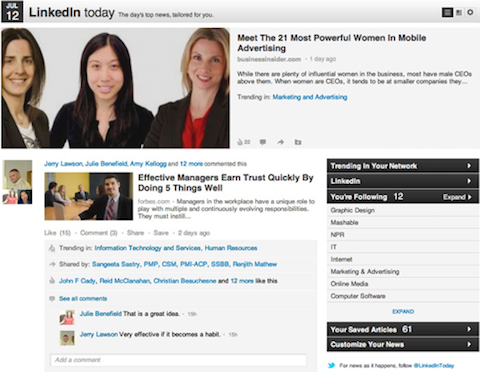 LinkedIn is rolling out a new tab called "Trending in Your Network." "This newly redesigned Homepage is rolling out to all members over the next few weeks." Why isn’t social media working for my business? What are your favorite ways to keep up with Facebook? 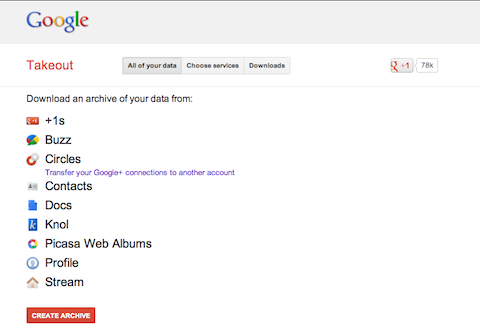 Google Announces Google Takeout for Google+ Users With Multiple Accounts: Google Takeout allows Google+ users with multiple accounts to transfer their Google+ circles and other connections between accounts. There’s a 7-day waiting period after you request the transfer during which you can cancel the transfer. Read how it works first. "This tool transfers your Google+ circles and connections from a 'source' account to a 'destination' account." 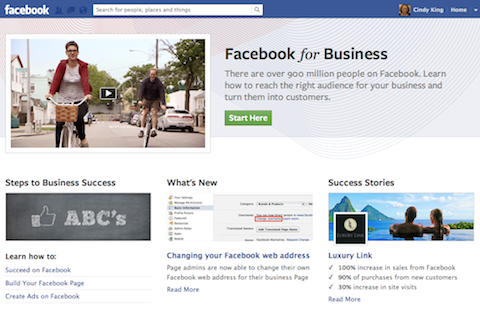 Check out the latest information and best practices for your Facebook marketing. 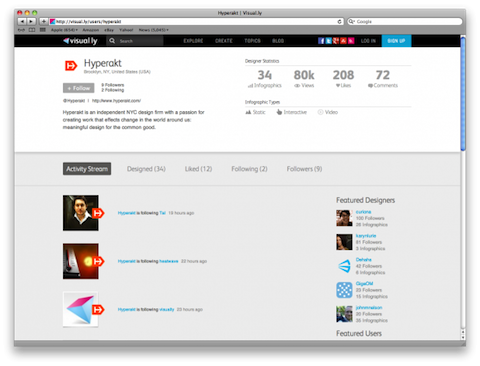 The 32,000 designers who currently use Visual.ly also get improved profiles to enable them to promote their designs and connect directly with brands and publishers looking to commission infographics. 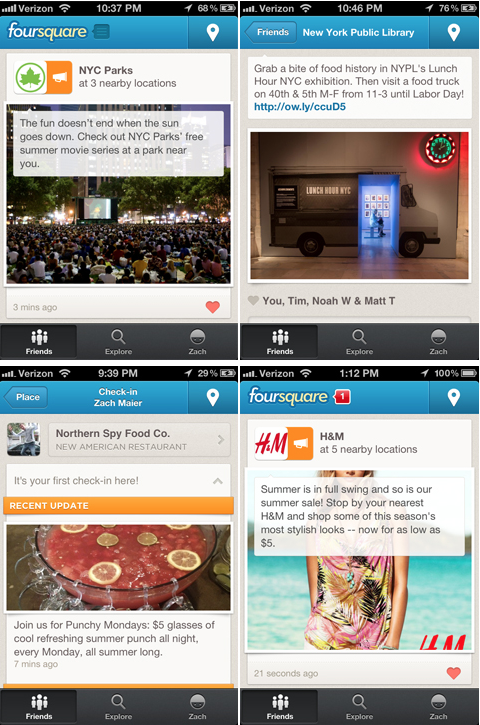 "Keep up with news from places you frequent." Swifter Navigation for TweetDeck: The latest updates make it easier for you to browse and manage your columns on this social media management tool. This faster version of TweetDeck is available now at tweetdeck.com, where you can download TweetDeck for Mac and Windows, access the Chrome app or sign in to web.tweetdeck.com. 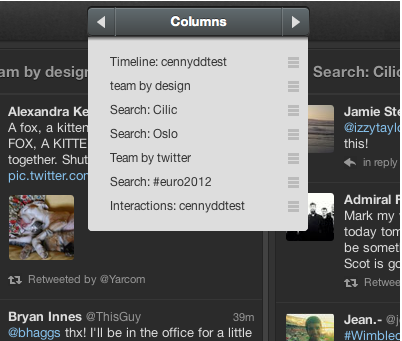 Now on TweetDeck, "your columns are arranged in one continuous horizontal row, allowing you to navigate smoothly left and right with the scrollbar." Social Buzz Club: This is a network social media influencers who share each other’s content on the social networks driving more traffic, visibility and profits. Airtime: A Facebook app to video chat with your friends on any platform. No download required, just login with Facebook and start video chatting with your friends immediately, right in your browser.